The Sheldon Jackson Museum’s March Artifacts of the Month are two Tlingit spruce root baskets (SJ-2011-1-1 and SJ-2011-1-2). Both baskets are from the early twentieth century and have design elements incorporating dyed grass or maidenhair fern. 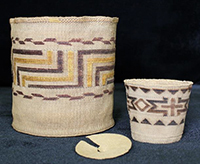 Although both of the baskets are slightly damaged, they are beautiful examples of fine weaving and false embroidery and are interesting for their connection to a figure in the Presbyterian Church in Sitka. The March Artifacts of the Month were generously donated to the Sheldon Jackson Museum by Dr. Jackson L. Webster in April of 2011. Webster, a professor at Virginia Tech University, collected the baskets while he was serving as pastor at the Presbyterian Church in Sitka and the Sheldon Jackson School from 1928 to 1940. He also served the Presbyterian Church at Wrangell from 1945-1947. His children, their spouses, and his parents, were all volunteers at Sheldon Jackson College in the 1980s. The larger of the two baskets (SJ-2011-1-1) is decorated with three bands of design in dyed root and “false embroidery” of dyed grass or maidenhair fern stem (?). Grass and dyed root is woven in the uppermost five rows of twining below the braid rim. The design elements used are tentatively identified as half units of the “feather wings of the arrow” (top and bottom bands) and “shaman’s hat” (middle band). The decoration just below the rim consists of three dyed rows (two green, one red in between), overlaid with spots of grass and interspersed with six half “feather wing of the arrow” units used as individual units. A cardboard disk is sewn on the inside of the basket to the bottom with thread in coarse stitches. The basket is in relatively good condition, but the rim is slightly misshapen and warped and has a small mark of dark discoloration, possibly ink, in between two of the shapes forming a shaman’s hat design. The smaller of the two baskets (SJ-2011-1-2) has a detached bottom (shown in the foreground in the photograph of the baskets and on exhibit in the case) and is also made of twined spruce root. It is decorated with three bands of design in “false embroidery” of dyed grass or maidenhair fern stem (?). The top and bottom rows are designed with a row of triangles. The central band includes a cross pattern, diamonds, and an unidentified design. The basket is in good condition, although the bottom is detached from the sides at the turn and there is cracking along the warp and weft. The Tlingit had six styles of weave, not including the fish trap, checkerboard plaiting or mat making, the embroidery in grasses and plant stems, and several plaited border edges [footnote 1]. The styles were all twined weaving, in which a regular series of warp strands are enclosed by a cross-twining of the weft. In all weaving, the progress of work is from left to right and the outer woof thread crosses from up, down, and around. The gathering, preparation, and weaving of spruce root was women’s work. In the spring and fall, women went into the woods with digging sticks (kart) usually made of alder or hemlock and sharpened and fire-hardened at both ends [footnote 2]. Elders selected a tree and the ground around the roots would be prodded at a right angle until a desirable lead was located. Using the digging stick and hand, the root was followed up to its end and sections ranging from three to twenty feet in length were made into small coils and tied around the middle. Within a day of gathering, the bark on the roots was removed by placing the coils over hot coals one side at a time until the exterior was slightly charred. The coils were then straightened and passed through an eena, a rough stick stuck in the ground with a v-like formation at the top, the left hand regulating pressure on the root while the right steadily drew it through the split. The coils were then soaked in water before any sap on its surface could dry. Generally, the root would be left for several months to season in storage and splitting and weaving would commence in the winter. Splitting the root was a process unto itself. Prior to splitting or handling, the root was re-soaked or moistened to make it pliable. The root strand was then split with sections for warp and weft separately maintained. Each strand is known as khul katst (“split”) and has three parts. The outside layer has a smooth polished surface next to the bark called khart ku’h-khe (“root outside”). The “root outside” is the most valued and supplies the woof or weft strand that makes the exteriors of baskets look polished. The next layer is called khart thla’r-tu (“root inside”) and has a fibrous, uneven surface but is of good color and strength and comprises the warp of the basket. The inner section of the root is called khart tu-qwu’t-see (“root thrown away”) and, as implied by its name, is discarded. general admission is $5, $4 for seniors, and free for those 18 and under or members of either the Friends of the Sheldon Jackson Museum or Friends of the Alaska State Museum. 1 Note that since the Strawberry weave is not an actual weave, but a variation of Emmons’ Weave #1, it is also correct to say that there are five kinds of weave. See Spruce Root Basketry of the Alaska Tlingit by Frances Paul. 2 Grasses and plant stems were also gathered when young and during the summer and fall, sometimes dyed, and woven over the woof strands for overlay or false embroidery. Grasses used include Fowl manna grass, Blue joint grass, Tufted hair grass, Slender reed grass, Alaska brome grass, Beach rye grass, Maidenhair fern, and Marsh horsetail. Stains or dyes in basketry include Alder and hemlock bark boiled in urine for red; Salmonberry leaves for pink; Huckleberries, bog cranberries, and blueberries for purple-blue; and yellow tree lichen or wolf moss for yellow. The stem of the maidenhair fern was boiled, dried, and then split to produce colors ranging from a reddish to a blackish purple. Much of the older Tlingit basket embroidery was done with this plant stem.